We have a few plans in the pipeline for this coming summer. Already booked are tickets to two local festivals, Common People, in our home town of Southampton (and walking distance!) in May, and Victorious Festival in August, a 20 minute train ride away, at the next town from us, Portsmouth. I’m now even more excited having checked the new line up for Victorious to see that The Fratellis are playing – we haven’t seen them since we watched them on the Pyramid Stage at Glastonbury. 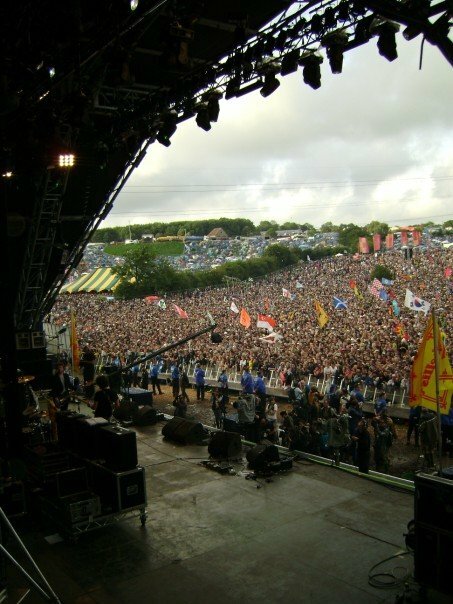 And yes, I mean we were ON the stage at Glastonbury! We also have a dinner date onboard the Watercress Line Bell Dining Train in May, which Darren booked for us for my birthday. I’m looking forward to my 4 course dinner – but I can’t decide from the choice of deserts. Luckily the other courses are set! After we sell our shop, we have already shook hands to take a trip to the Trough of Bowland, which was recommended to us by a couple we met at the No1 Traveller Lounge on our recent trip to Thailand. We have a couple who seem very interested in its sale, so hopefully this trip will be soon. We are planning it for our first weekend off! I’m also looking for a few days we are both not working for a trip to Champneys Spa, most probably the one in the New Forest. We have a great deal with our life insurance which means we get 75% of the spa breaks – so it would be rude not to take advantage! Two of our friends have set if to Malaysia for a few months, so it is likely that we will be heading off for a few weeks to visit them (and tick off another country or two from our list) – We are planning this for June. We also have an invite to Tuscany for a wedding (and EVERYONE loves a wedding!) in October. And what better way to make this a trip than to drive through France and Italy to get there. We own a convertible too, so no doubt this will be great fun, so long as the weather holds! For future trips, we have started to compile a list. Take a look at our ‘Bucket List‘ with a list of all the things we want to do, and let us know if we’ve missed something! More so, we would love suggestions for places to go and things to do locally to us in and Southampton. We really want to get to know more about our local area. And next week, we really get to celebrate our local area and its heritage with sailing. The Queen will be in Southampton to name the Britannia Cruise Ship, and I am booking the day off work, so that I can spend my day in what I am sure will be a very excitable crowd of Sotonians, hoping for a glimpse of Her Majesty!